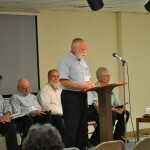 Jim Custer, left, from Grace Polaris, a Grace Brethren church in Columbus, Ohio, was part of a panel on the Bible and Spirituality in the Brethren movement. 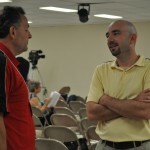 Ron Boehm and Pat Phillips take a break in the sessions. 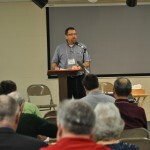 Dr. Jared Burkholder talks about Community, Family, and Individual in Brethren Spirituality. 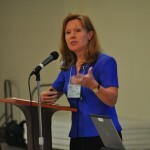 Dr. Christy Hill shares about Spiritual Formation. 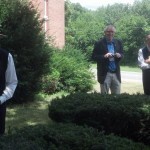 Dr. Jared Burkholder is on the faculty at Grace College. 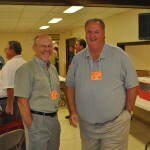 Jim Hill and Rick Hartley, pastor of the Grace Brethren Church, Brookville, Ohio. 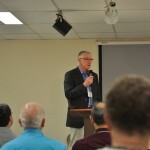 Grace College professor Dr. Jared Burkholder tapped into a new collection in the developing Grace Brethren Archives Friday as he spoke in the general session of the Brethren World Assembly. 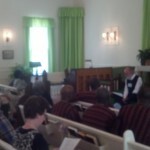 Speaking on how the Brethren’s sense of spiritual identity was influenced by his or her community’s place in history. 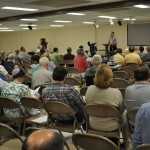 The World Assembly is being held at the Brethren Heritage Center, Brookville, Ohio, and concludes today (Saturday). 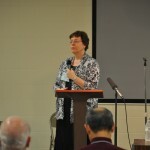 Burkholder shared insights into the life of Estella Myers, pioneer Grace Brethren missionary to Africa, drawn from her letters to loved ones at home. 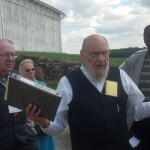 Those letters are now part of the Grace Brethren Archives at Grace College and Seminary, thanks to the generosity of Encompass World Partners, Miss Myers sending organization in the early 20th century. 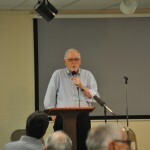 He also talked about Dr. Herman Hoyt, former president of Grace College and Seminary, and Peter Nead, an Old Order German Baptist elder in the late 19th century. 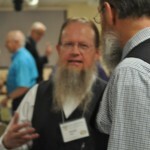 “As one who, out of habit, thinks within a historical framework, I want to reflect on the way these individuals saw themselves within the scope of spiritual history – how they ‘fit’ in it – as well as on the tensions and issues their experiences within the Brethren community raise for us today,” he said in his introduction. 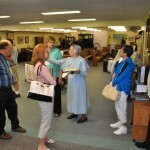 Breakout sessions and panels also looked at “The Spiritual Writings of Alexander Mack, Jr.,” “Brethren Hymnody,” “Separation from the World and Engagement with the World,” and “Brethren Devotional Literature and Poetry.” In the afternoon, a tour of historic Brethren sites in the Dayton area was offered, along with tours of the Brethren Heritage Center. 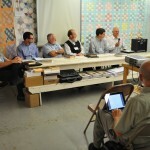 For more photos, see the Grace Connect page on Facebook.